LC Li-poly FOXY battery pack of the second generation (version 2014) with increased load capacity of 40 / 80C, charging up to 2C. Four-cell 4s1p 14.8V 2200 mAh, service connector JST-EH. Newly function LC (lipo check - signaling capacity). After pressing on integrated micro-module for a few seconds to light up LEDs indicating the remaining capacity of the battery pack at levels of 0, 30%, 60% and 100%. Lithium batteries FOXY second generation (version 2014) pumped into the veins of your models with new fresh energy! With the advanced technology applied during production guarantee an extremely high current carrying capacity in discharge enable fast charging and compared to previous-generation batteries FOXY have a significantly lower weight. All this at a traditionally high durability and favorable purchase price. 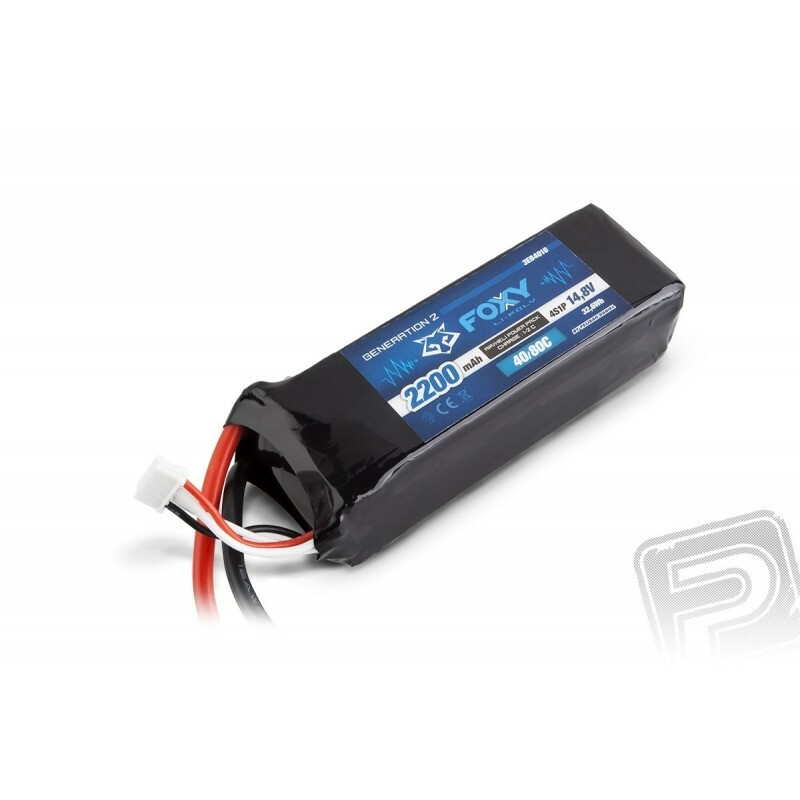 FOXY batteries have a standard discharge current of 40C to 80C peak and rapid charging (1-2C). They are designed for demanding applications in model aircraft for classical and 3D aerobatics, fan-powered models and helicopters for classical and 3D aerobatics. High current capability ensures maximum use of engine power and allows the aggressive style of flying, while maintaining a very good long-term durability. FOXY batteries charge current greater than 2C for normal operation recommended that you use currents of between 1-2C. We recommend using the balancer at each charge. FOXY batteries do not require initial formation, but if you intend to set charge rates higher than 1C, recommended for the first three charging cycles exceed current 1C. Before charging it is not necessary to discharge - eg. You can safely charge a battery discharged to 50%. Package includes: FOXY G2 battery, instructions.